Take a large frying pan and heat it over the oven. When very hot, add oil, scallions and the pepper. Stir fry for a couple of minutes till softened. Add rice and stir-fry about 5 minutes until heated thoroughly. Push the rice away from the centre of the rice, add the eggs, and stir until scrambled. 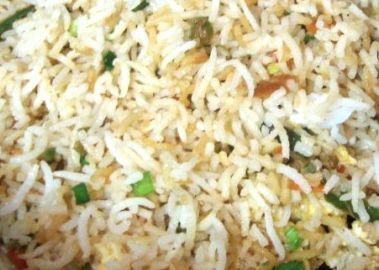 Combine all ingredients together – add a little soy sauce and then pour into a dish and devour the steamy aromatic Egg Fried Rice, which I am sure you would in no time.